Since late December I’ve been doing another fractal spinning project. This is a technique where you take a braid with multiple colors and split it up into fat and thin chunks. You spin then ply in a specific way so you get nice barber-pole mixes of color between stretches of solid color. My first project with this was with some fiber from Sweet Georgia yarn, back in Oct 2015. This new project is with a BFL/Silk blend from Frabjous Fibers in the Desert Rose colorway. 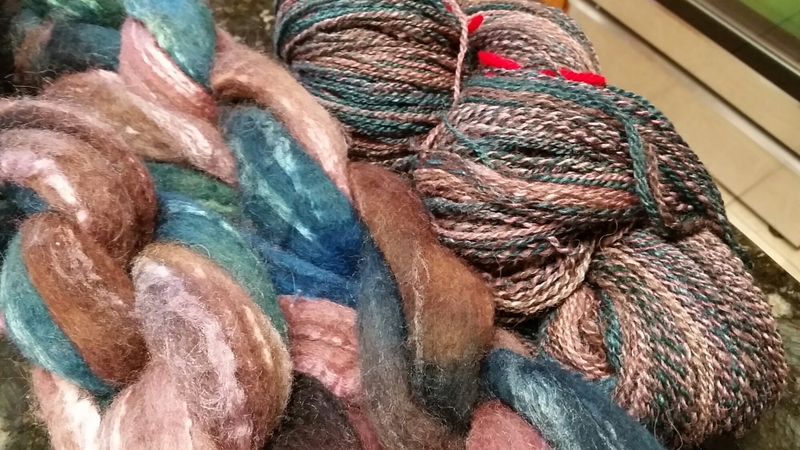 To be honest, I was not that thrilled with the colors as I was spinning the first skein, but the yarn came out BEAUTIFUL. So I’m inspired to keep going. I’m spinning it fairly thin, and the 2-ply yarn has come out around sport weight. So not too heavy, good for our not-so-cold South Carolina “winters”. I’ve had several knitting projects going as well, particularly socks! I’ll post about those all on their own. This entry was posted in Art, Fiber and tagged BFL-Silk Blend, Fractal Spinning, Spinning. Bookmark the permalink.